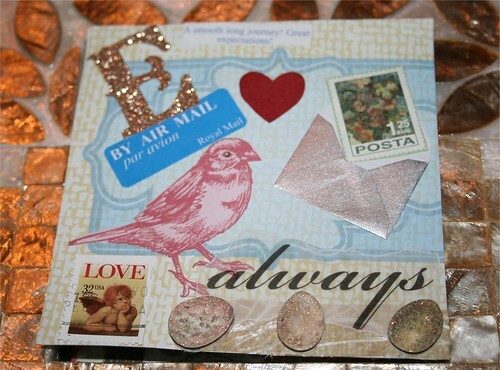 Love Always Collage Card, originally uploaded by DianthusMoon. This is a collage card made up mostly from things in my scrapbox. I actually have two of those-the big one and the smaller one. Both filled to the gills. I did add the glittery eggs along the bottom. I hope to get outside again tomorrow, but it’s going to be pushing 80 or higher. I have winter clothes to change out to summer. Have to see how I feel as my elbows are so sore from pulling weeds and digging.